Don’t miss out on Alberta’s annual nail biter – The Labour Day Classic! Whether you’re Team Esks or Team Stamps, this game is going to be a blast. As a union member you can enjoy a special reduced price and take your whole family and even a few friends. Belonging to a union brings many benefits, now you can add this special offer to the list. 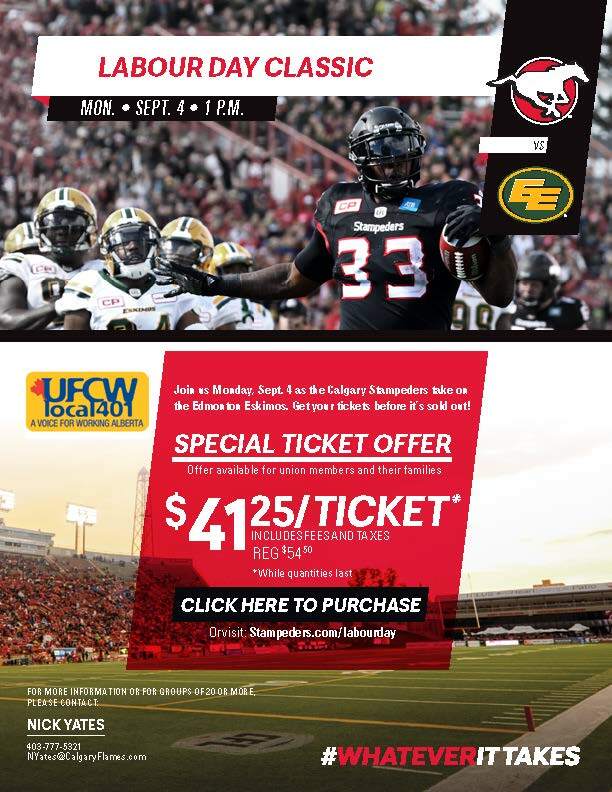 There’s an early bird draw for UFCW members that plan on coming out for the Labour Day Classic! Take advantage soon before seat inventory runs out! Any member that purchases on or before the dates below will be entered into a draw for…..
Also once a member has purchased tickets they will be eligible for all future draws.